One of the best tools to prove value to skeptical prospect hides in plain sight. It’s the ROI metric. Return on Investment. Consider this: 98% of all salespeople fail to prove ROI to the satisfaction of buyers, according to research by Ernst and Young. Yet there are dozens of ways you can read a prospect company’s income statement or balance sheet to identify issues to solve and strengthen your case with ROI. 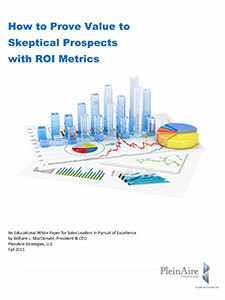 And we show you how in this latest white paper from Bill MacDonald, “How to Prove Value to Skeptical Prospects with ROI Metrics.” What’s more, it’s chock full of excellent ROI case studies to fuel your imagination for future sales.